I created this illustration as part of the Star Trek 50th anniversary exhibition at Constellations in Liverpool. This epic battle between Kirk and the Gorn was the first episode to air in colour but I digitally de-mastered it into glorious black and white. 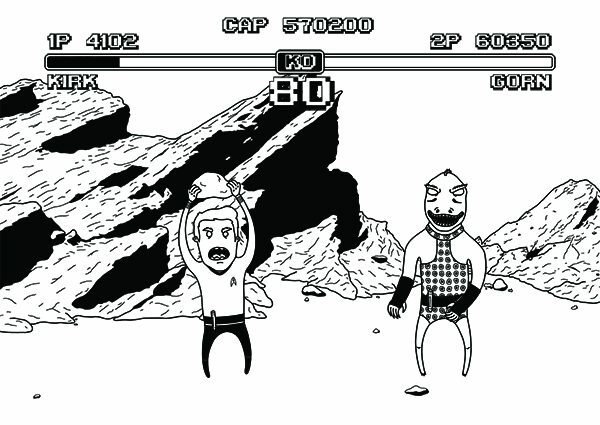 I added a touch of humour to the fight scene by giving it a bit of a Street Fighter twist. Alternative Aesthetics is a human. This human is Colin Kersley. Available to create images with a hint of humour in glorious black and white for editorial, advertising, packaging, … Show more. Send a message directly to Alternative Aesthetics . Alternative Aesthetics is a human. This human is Colin Kersley. Available to create images with a hint of humour in glorious black and white for editorial, advertising, packaging, murals, books, gig posters, album artwork, clothing. You name it, I want to create for it!